Is Grocery Store Fish Safe for Sushi? Ahi tuna is typically served seared. 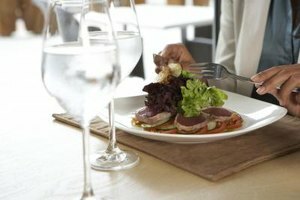 A feature on menus at high-end restaurants, ahi – or yellowfin – tuna actually takes very little time and effort to prepare. This tuna has a beautiful deep red color that turns more orange as it cooks. If your family loves steak, they will likely love this substantial and hearty fish. Ahi tuna is typically seared, with the inside left raw. Because of this, you must purchase sushi- or sashimi-grade fish. Reputable fish mongers and some grocery stores carry these grades of fish. Look for unbruised cuts. Ahi tuna should not smell fishy, nor should the flesh be flaky. Either of these characteristics signals that the tuna is not fresh. Buy the fish on the day you want to prepare the dinner, and store the fish in the refrigerator until you are ready to cook it. Season the ahi as you would a steak, using pepper, fennel seed, five-spice powder or grill seasoning. Alternatively, you can marinate the steak. A combination of lime juice, cilantro, garlic, jalapeno and olive oil works well, as does a mixture of sesame oil, soy sauce, ginger and green onion. To cook the fish, sear it lightly, about 2 minutes on each side. If you have any doubts that the fish you purchased is fresh, sushi or sashimi-grade tuna, cook it all the way through. Accompany your seared ahi tuna with a green vegetable such as asparagus, broccoli or kale. Salads also work well with tuna. If you season your tuna with fennel seeds, try a fennel salad. For an Asian touch, serve an Asian slaw. A mixed green salad with a creamy dressing that compliments your marinade or seasonings work s nicely. For example, use a Caesar dressing to accompany the tuna marinated in sesame oil. Starchy side dishes work well with ahi tuna. Fine restaurants pair ahi with fancy mashed potatoes with green onions and garlic. In Japan, plain white rice is a traditional accompaniment. To stick with an Asian theme, you can serve an Asian noodle dish such as a cold soba noodle salad with shiitake mushrooms.